This paper investigates the potential contribution of sociological perspectives for business ethics teaching. After a brief and selective literature review, the paper suggests starting with sociological thinking and three aspects of it: sociological concepts, sociological imagination, and postponed judgment. After presenting two short case teaching stories (about speaking up or not) and three sociological concepts or frameworks (deviance, roles, and power), the potential inspiration value of a sociological checklist for analysing or diagnosing business ethics cases is tried out. As an open ending, some short final suggestions are made for further use of sociological perspectives in both business ethics teaching and research. In addition to the anonymous reviewers, a special thanks to Ron Sims, Chandler Johnson, Øyvind Kvalnes, Tore Bakken for any valuable comments. Any remaining imperfection, esp. language-wise, is my own responsibility. Giddens and Sutton (2014, 175–178). Ritzer 2007 (1075–1082, 1135–1140—E. Goode’s and P. Rock’s & D. Downes’ entries). Ritzer (2007) (395–-3956, 3959–3962—D.D. Franks’ and M.J. Hindin’s entries). Engelstad (2012), Crozier and Friedberg (1980, 30–44), Giddens and Sutton (2014, 209–212). Ritzer (2007) (3597-3598, 3603-3606 – J.L. Powell’s and S. Thye’s entries). aCf. By the way, for further reading see skeptic philosopher Sextus Empiricus who suggests similarly a “suspension of judgment” (epoché, furthering ataraxia), see https://plato.stanford.edu/entries/sextus-empiricus/, or much more recently see e.g. Næss (1968), Bostad (2011). Adorno, Th. W., Albert, H., Dahrendorf, R., Habermas, J., Pilot, H. & Popper, K. R (1976), (Eds)., The positivist dispute in german sociology, London: Heinemann (mostly also here: http://www.autodidactproject.org/other/positivismusstreit/contents.html; the original text collection in German was published in 1969). Burrell, G. (2016). Editorial to a “virtual special issue” of the Journal of Business Ethics, accessible online here (acc 11th Dec, 2016): http://www.springer.com/philosophy/ethics+and+moral+philosophy/journal/10551. Castells, M. (2016). A sociology of power: My intellectual journey. Annual Review of Sociology, 42, 1–19 (http://www.annualreviews.org/doi/abs/10.1146/annurev-soc-081715-074158). Horkheimer, M. (1972). Traditional and critical theory. in Critical theory: Selected essays, (transl. M. O’Connell), New York: Herder & Herder, 188–243 (German original of 1937: http://lesekreis.blogsport.de/images/MaxHorkheimerTraditionelleundkritischeTheorie.pdf). Kvalnes, Ø. (2015), Moral reasoning at work: Rethinking ethics in organizations, Basingstoke: Palgrave MacMillan. http://link.springer.com/book/10.1057%2F9781137532619. Ritzer, G. (2007). (Ed. ), The Blackwell encyclopedia of sociology. Malden: Blackwell (http://philosociology.com/UPLOADS/_PHILOSOCIOLOGY.ir_Blackwell%20Encyclopedia%20of%20Sociology_George%20Ritzer.pdf). Seele, P. (2016). What makes a business ethicist? A reflection on the transition from applied philosophy to critical thinking. 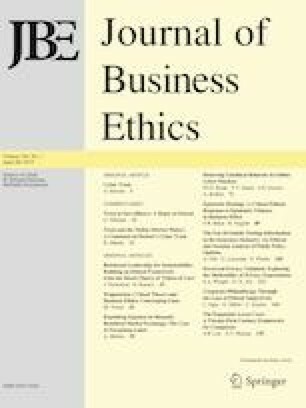 Journal of Business Ethics (online first, 27 April, http://link.springer.com/article/10.1007/s10551-016-3177-8). Weber, M. (1978). Economy and society. In G. Roth & C. Wittich (Ed. ), Berkeley: University of California Press, (transl based on the 4th 1956 German edition, German orig. 1922). The text is also available online: https://ia800305.us.archive.org/25/items/MaxWeberEconomyAndSociety/MaxWeberEconomyAndSociety.pdf. Werhane, P.H. & Moriarty, B. (2009). Moral imagination and management decision making. Bridge Papers, http://www.corporate-ethics.org/pdf/moral_imagination.pdf (acc 3 Dec 2016).